What a difference a week makes. 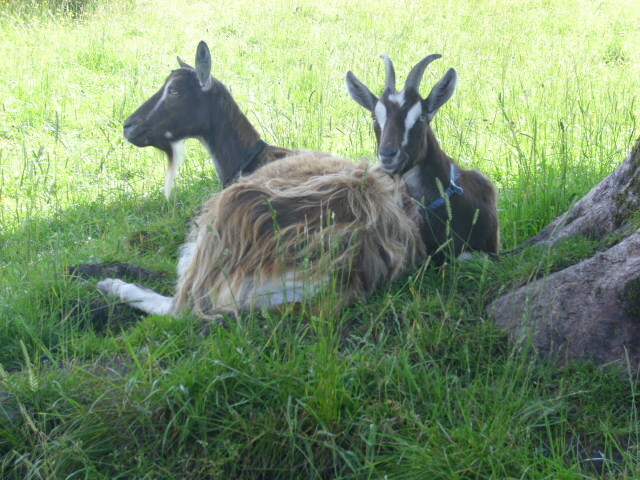 Last week I took this pic of Bella and Enid sheltering from the heat of the sun under the Sycamore tree. The last 3 days have been like a return to Winter. Have’nt opened the polytunnels for days as there have been such strong gusts of wind. Huge amounts of rain have fallen and it’s been cold too. I’ve hears it said that “a week is a long time in politics.” Well, a week is a long time when it comes to Irish weather! So, what to do when stuck indoors in July. I cook and bake. Over the weekend I made 3 cakes which are almost gone, we did have lots of visitors! 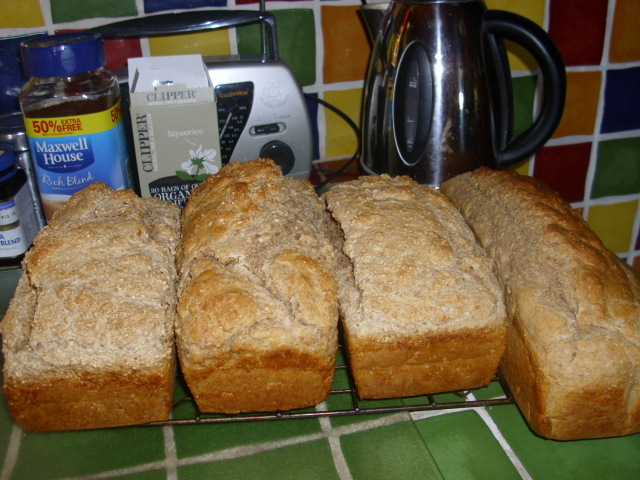 Also the 4 brown breads you see above. I always bake 4 together, 1 to use immediately and 3 for the freezer. 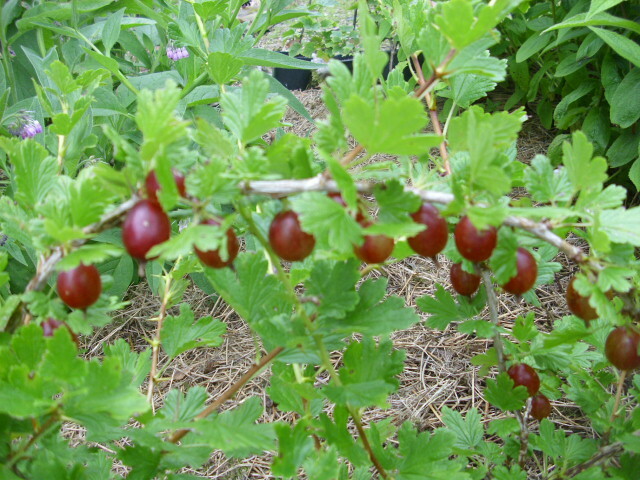 Gooseberries are ready for picking, a job for tomorrow. 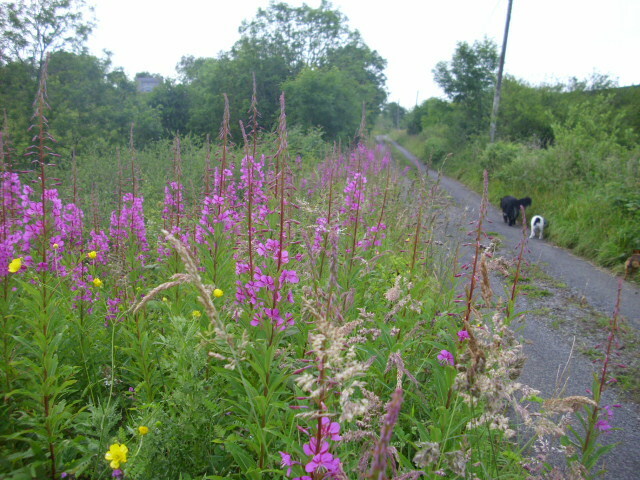 The Rosebay Willowherb is still looking lovely on the lane. Won’t be bringing it into the garden though as it does spread like crazy. 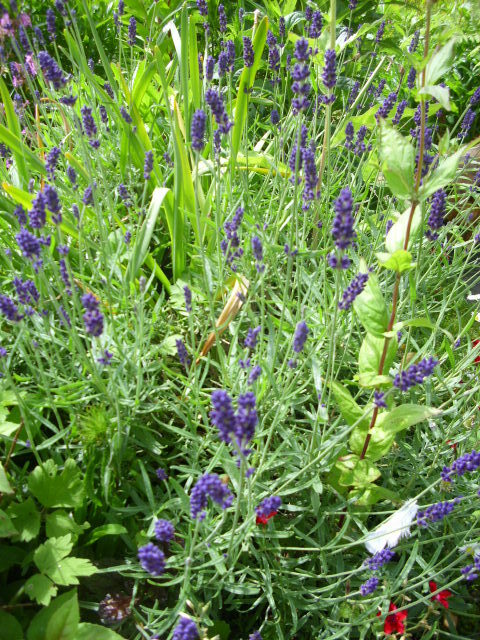 The Lavender is flowering, unaffected by the rain and wind, although the scent is not so good without sunshine. Lavender has a multitude of uses. It can be used in cooking, from flavouring for jams to crystallizing the flowers for cake decoration. 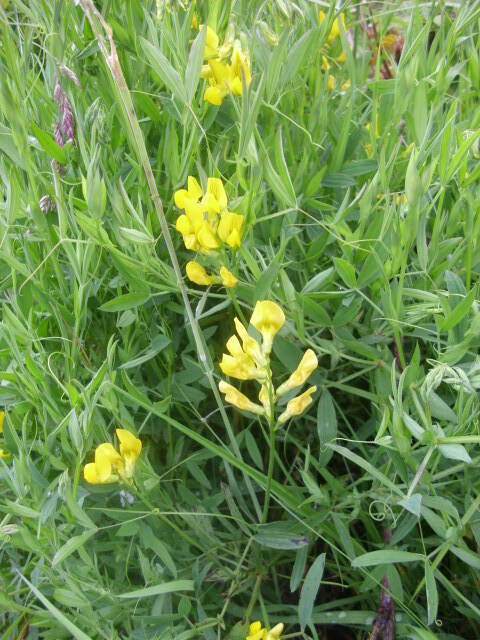 Medicinally it can be infused as a tea for headaches, to calm nerves and ease flatulence. Household use includes using the flower heads in sachets to protect clothing from Moths. All that and it looks good too! The good news on the weather is things are set to improve with high pressure dominating by next weekend. Fingers crossed! Flowering in June @ Prospect Cottage. In the hedgerow at the moment this little plant is in flower. I don’t have a clue what it is! Anyone know? It is a really bright yellow , my eye is always drawn to it. 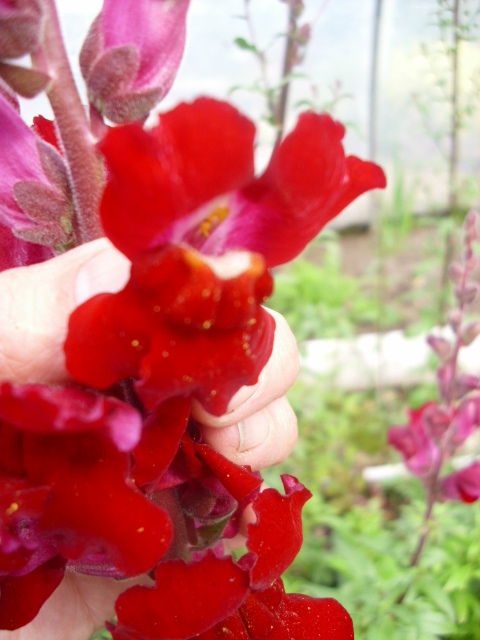 In the small polytunnel the Antirrhinum or Snapdragon as it is commonly known has self seeded profusely. As a child I used to love pressing on the “jaws” of the flower to make them open and close their “mouths”. Was’nt I easily pleased! Antirrhinums are really perennials even though most garden books refer to them as half hardy annuals. They even withstood the -17c temperature we had here this past Winter! They come in a multitude of colours and like a sunny position. This Honeysuckle was grown from a cutting and grown on in a pot for several years. It is the common hedgerow variety. 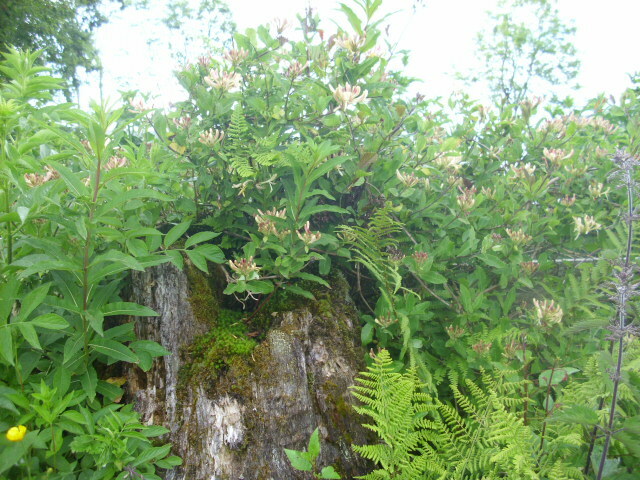 Last year I planted it in the cavity of a decaying tree stump which it seems to love. It put on a huge amount of growth, maybe it is getting extra nourishment from the decaying wood. The scent is heavenly. The Carnations have started flowering in the last week despite the lack of sun. These were a birthday present from my Mother some years ago. 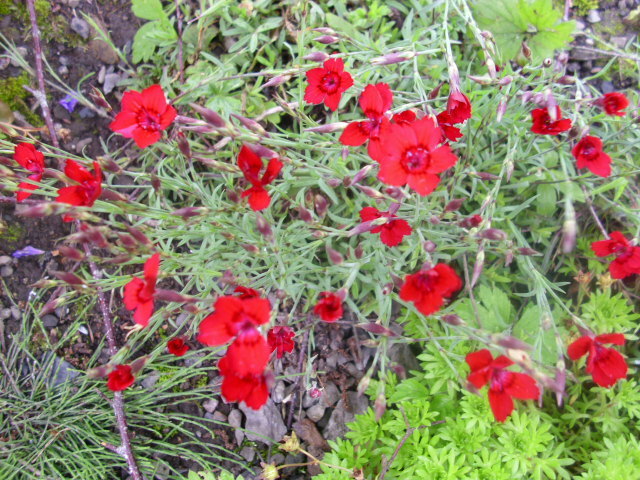 They propogate easily from cuttings taken in July and I now have several plantings of them about the garden. The have a sweet subtle scent. 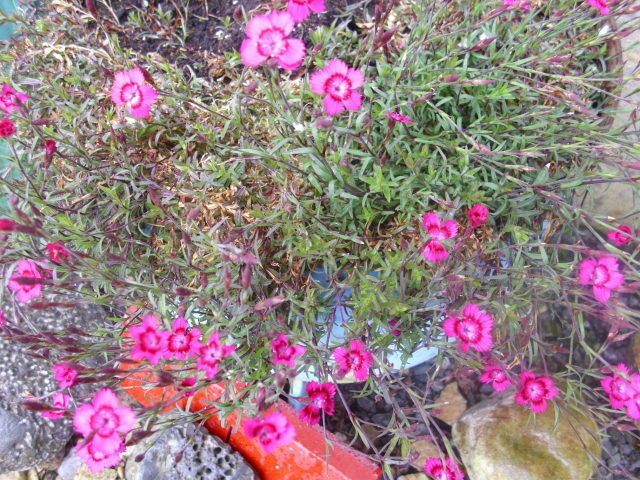 This little Dianthus was grown from seed in Spring 2010, it did’nt flower until now. The wait was worth it. 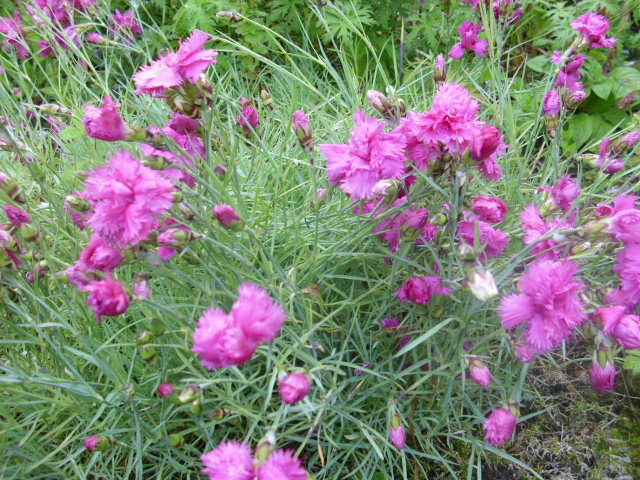 And to finish yet another of the Dianthus family. A brilliant red, it is called Flashing Light. I can see why! 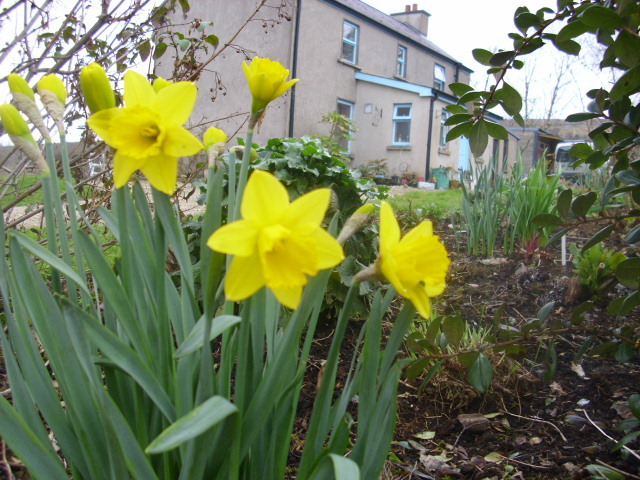 Daffodils blooming, grass growing @ Prospect Cottage. The first Daffodils opened here yesterday. Things happen a little later here as we are 110 metres above sea level. The bees are in ecstacy to have a supply of nectar again. It’s lovely to watch them flitting from flower to flower. I wonder why so many Spring flowers are yellow? The fields are greening up again, almost recovered from the hard Winter frost. Daphne is delighted to have fresh pickings again. No artificial fertilisers are used on the land here so no pollution runoff. Actually we are very lucky here as our smallholding is bounded by an organic farm. The only thing we put on the land is lime every few years. The land here is fairly acidic because of the high rainfall. 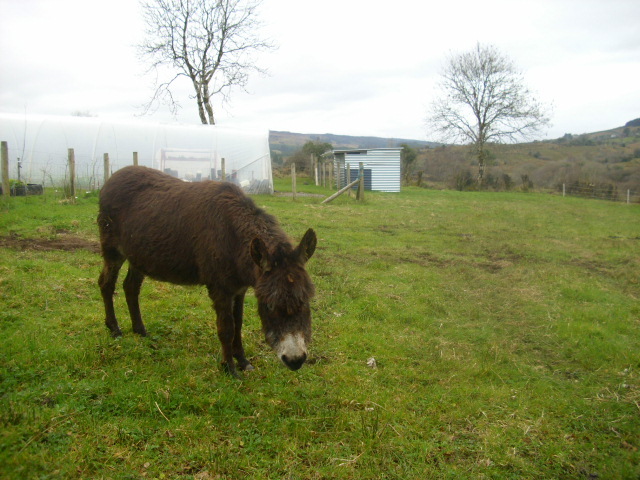 The application of lime helps to sweeten the land and improves grass growth. Everything here, vegetables, fruits and animal health is dependant on soil health so it is incredibly important to look after it. 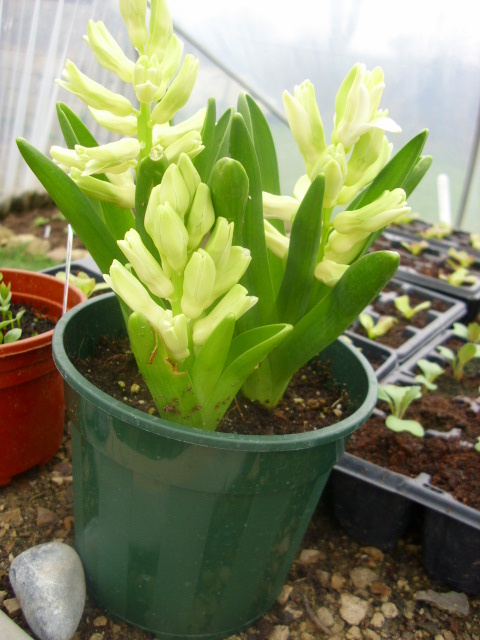 These hyacinths were some of my January sales buys. They were brought on in the polytunnel. The flowers started opening up yesterday so I brought them into the house to get the full benefit of their glorious scent. This morning the heat in the house had coaxed the flowers to open fully. The scent pervading the whole house today is gorgeous, I love it. The weather here today is great, sunny since early morning. It feels like Summer. It’s the first day this year that I am only wearing one layer of clothing. Yippee, I’m off now to sow parsnip seed and continue mulching the fruit area.